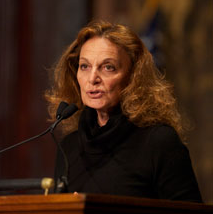 Being a businesswoman in the 1970s meant putting up with a lot of sexism, iconic designer Diane von Furstenberg told a Georgetown audience Nov. 1, but it didn’t impede her success.Von Furstenberg spoke at the university’s inaugural presentation in a series on women and leadership. The innovation that turned von Furstenberg into a household name was the wrap dress, and although its popularity landed her on the cover of Newsweek before she turned 30, she still had to fight for respect. She recalled being the only woman on a business flight back in the early days of her career. It happened to be the day the newspaper featured her on its front page, but von Furstenberg said she didn’t tell him that. As her company grew, she began to trust her own instincts. In addition to being a businesswoman, von Furstenberg serves on the board of the global women’s rights group Vital Voices and participates in other charitable endeavors. That includes her Diller-von Furstenberg Family Foundation, which gives out scholarships to outstanding female leaders. Von Furstenberg married American media mogul Barry Diller in 2001 after divorcing German Prince Egon of Fürstenberg in 1972. The famous designer also led the Council of Fashion Designers of America’s design and sale of a T-shirt that raised $1 million for the Clinton Bush Haiti Fund. Sponsors of the talk included Georgetown Women in International Affairs and the Mortara Center for International Studies, which are part of Walsh School of Foreign Service. Other sponsors of the talk were the Center for Public and Nonprofit Leadership, the Georgetown Public Policy Institute and the Office of Institutional Diversity and Equity.